Alcohol-based skin antiseptics are based on ethanol, propan-2-ol or propan-1-ol. Some products contain additional non-volatile biocidal agents such as chlorhexidine digluconate, benzalkonium chloride, hydrogen peroxide, povidone iodine or octenidine dihydrochloride. Currently, only chlorhexidine digluconate has a proven health benefit (prevention of catheter-associated bloodstream infections and probably also surgical site infections). Octenidine dihydrochloride may also have a health benefit but the evidence is sparse. There is no health benefit for additional benzalkonium chloride, hydrogen peroxide or povidone iodine. Chlorhexidine digluconate and benzalkonium chloride cause a strong and stable MIC increase in numerous mainly Gram-negative species. Cross-tolerance is frequently found between benzalkonium chloride and chlorhexidine digluconate and to various antibiotics. Horizontal gene transfer can be induced by chlorhexidine digluconate in E. coli. Antibiotic resistance gene expression can be increased by chlorhexidine digluconate in a vanA E. faecium. And efflux pump genes can be up-regulated in some species by benzalkonium chloride and chlorhexidine digluconate. The overall balance seems to justify the use of chlorhexidine digluconate in alcohol despite a number of risks. It may also be favourable for octenidine dihydrochloride in alcohol (sparse evidence for a health benefit). 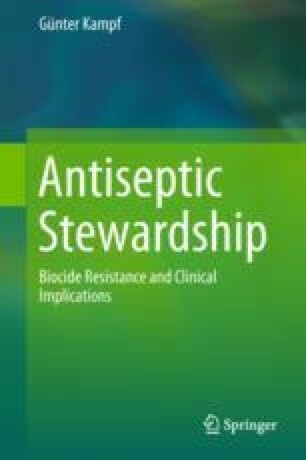 Alcohol-based skin antiseptics with benzalkonium chloride should be replaced considering the magnitude of risks and the lack of a health benefit.